This is a sheet that I give to my students to keep in their writing folders to reference while reading or writing. It gives definitions of different types of figurative language and then examples of them. Definitions for Kids Does not include all figurative language. Does include figurative language that is significant to my 7th-grade ELA class. This handout provides students with the definitions of four types of figurative language (metaphors, similes, idioms, and hyperbole) as well as several examples of each of these. In addition, there are spaces for students to add their own examples of each type of figurative language. This document aids students with their understanding of elements of figurative language. 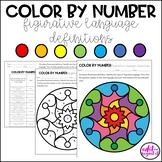 It gives the definition of the elements of figurative language and also gives examples for each element. Figurative language terms, definitions, and examples. Sheet also includes space for students to write their own example. 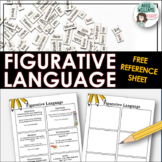 This simple reference sheet offers definitions and examples of some types of figurative language. This is a quick and easy resource for students and teachers. 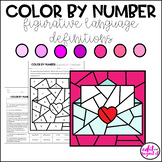 Includes definitions for the following figurative language terms: simile, metaphor, alliteration, onomatopoeia, personification, and hyperbole. It's formatted in a way that 8 are on a page, and you can cut them down to smaller cards. 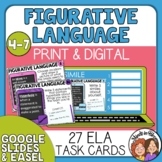 This is a half-page list of figurative language devices, definitions, and examples. Students can use this as a study guide and as a resource while working with text or worksheets you assign. 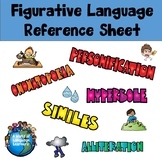 Included are 6 half sheet posters of definitions and examples of 6 different types of figurative language. -Use the half sheet posters to hang on your figurative language bulletin board for students to reference throughout a poetry unit.